I was traveling only for a month in the Philippines and yet I could observe some obvious cultural differences and unique characteristics compared to the German, European, Western culture I was socialized in. For more clarity, I will write about my observations in an alphabetical order. When you are traveling within the Philippines, you should always ask people who had already been to your next destination if there was an ATM. I am not kidding. At some places like El Nido or Banaue, there is no ATM. Sometimes the places accept payments with credit card, but of course, not all of them. It is always advisable to bring enough cash money with you, just in case. C – Talking about the Filipino bathroom. They do not call it ‘restroom’, but ‘comfort room’ (CR). Be aware to always, always have small money with you. Unfortunately, most of the times the ATM will give you 1000 and 500 Peso bills. Good luck changing that! Most of the Filipino usually do not have any change at all. I am not sure if some of them are not using this as a false excuse to be ‘tipped’ and make a little more money this way. Anyhow, it is very helpful always having plenty of coins and small bills with you. At the same time, Filipinos tend to charge you for everything, seriously everything. There are several environmental fees you have to pay only for visiting them. This might be a good thing if they use the money to keep the environment clean, which I am not entirely sure about yet. But there are even more fees that does not make any sense at all. For example, they charge you money only to enter a central bus station or to wait at the terminal for your boat to take off. Sometimes they might even take money from you in guesthouses for charging your electronical devices. After traveling to many countries, this was definitely something new to me. C like cigarettes. They cost nothing. Literally nothing! Not even 1 Euro which is super dangerous! If you are a smoker, you will be a smoker-smoker after your stay in the Philippines. Everyone is smoking everywhere all the time. Two downsides of cigarettes, well, rather smoking: Not only are Filipino kids selling cigarettes on the street, but also already smoking. A picture I just could not get used to… Do not ever buy from them and support them! Do not give them money. Most of the times they will give it to their parents anyway. They are better off if you take them out for something to eat or just buy them some food and drinks. Quick change of topic. How do you like dragonflies? In some parts in the Philippines, they are everywhere. Sometimes you can even find some special tours just to see them. I have always taken them for granted, but in the Philippines, I remembered how much I actually like them. They are part of my childhood memory when they were flying above our heads while my friends and I were playing in the lake. I really like their shape and colors! Pretty creatures! I came to the Philippines after I stayed for a whole year in the very North of our world. First Siberia, then Alaska. I was used to the so-called ‘White Nights’. In the summer months, it just would not get dark anymore. I was already a ‘night person’ before my time there, but the White Nights would not let me sleep at all anymore. At the end of the summer, it would change again, of course, and the night would come back. But when I came to Manila, the darkness was just overwhelming! All the sudden it was dark, I mean, totally night dark at 6pm! I could not believe it! My rhythm was already out of order because of the heavy jetlag due to 16 hours’ time difference, but the night! That came very unexpected! The darkness was so confusing to me that I was actually extremely tired at 9pm. Only because it felt to me like it was 3am. I was completely lost in time! E – Talking about my usual life as an owl. My rhythm changed entirely in the Philippines. While I usually had a very hard time going to bed before 1.30am and getting up early in the morning, well, I would say IMPOSSIBLE. But in the Philippines I was tired and ready for bed at 9pm and I could easily get up at 5am in the morning. If you like it or not, at the end you will turn into an early bird! Of course, I did not chose to do that. You just do not have another choice. Even if you go out at night and come back late, someone or something will wake you up in the morning. Roosters, puppies, dogs, cats, babies, kids, the heat, anything and anyone will spoil your precious sleep. It is just always noisy… No sleep in the Philippines! At the end of your vacation, you will sure need another one! 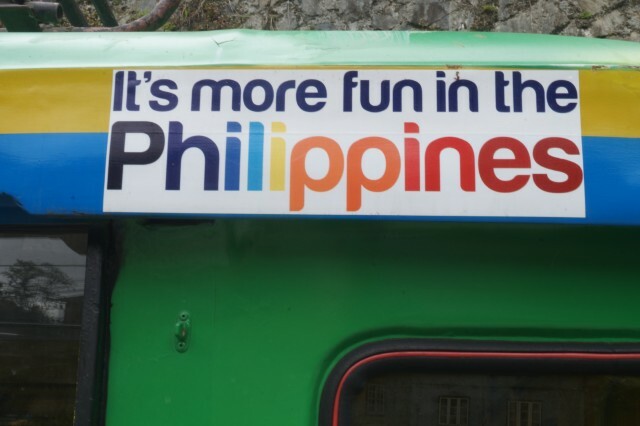 F – Like ‘Fun Filipinos’ or ‘It’s more fun in the Philippines!’ It is amazing how the Philippines are always in a good mood. No matter what, they will always smile or have a laugh. Their cheerfulness is addictive! After a while, you will catch yourself walking around always with a smile on your face. I guess that is the Filipino way of living! It truly is fun! Another wonderful creature that you can find and admire in the Philippines is the firefly. I missed to book a tour to see them, but if you have the chance, you should do it. I am sure it is worth it! That is surely the cherry on top of the ice cream, the perfect accessory for paradise. I was already talking about the fascinating good mood of the Philippines. Part of it might be their greeting culture. When I was walking on the street, when I was hiking, when I was relaxing at the beach, there will always be several Filipinos greeting you. Especially kids are happy when they see foreigners (sometimes for the first time). ‘Hi!’ ‘Hello!’ ‘Good morning!’ ‘Good afternoon!’ ‘Good evening!’ Shining eyes and a happy smile. But do not forget, always greet back! It is worth it because it just makes you and more importantly, the others feel good. Almost everything you want to explore in the Philippines requires a guide. You cannot go island hopping on your own. If you try to hike in the rice terraces, it is very likely you get lost at some point. You can easily find guided tours to a reasonable price. Plus, the guides are always fun! They know their business very well and will take very good care of you. At the end, they will make sure you had an unforgettable time. Funny fact: Most of the guides prefer guiding foreign tourists. Why? Because local tourists, mainly from Manila, do not know how to swim and are very bad in hiking. With them, every tour will require ‘Filipino time’. That means at least a couple of hours longer. 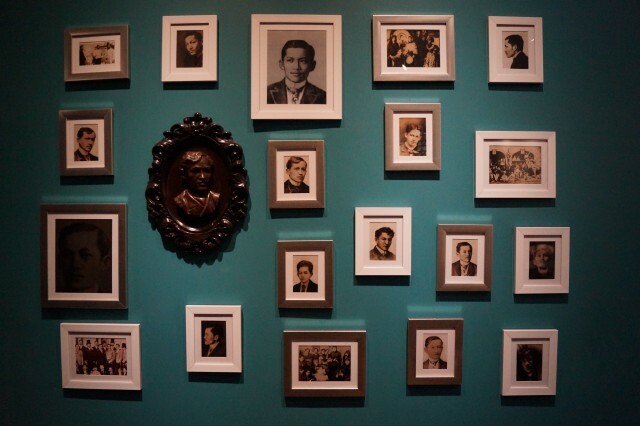 H – When I arrived in Manila, I learned all about the national hero José Rizal. HE IS THE GUY! Well, for the Philippines, of course. During the Spanish colonial period, he was a Filipino nationalist who strongly emphasized the outcome of education and being educated. Rizal is famous for his writings that even inspired participants of the anti-colonial revolution. At the end, he was executed by the Spanish colonial government for the crime of rebellion. I am 1,65m tall, well, rather short. Back in Germany, I always feel like the ‘little one’ looking up to all the tall people breathing different air up there. In the Philippines, I finally felt different. All the sudden I belonged to the ‘tall ones’. The average height of a Filipino is 1,62m; the one of a Filipina is 1,50m (referring to the website www.averageheight.co ). In comparison: The average German man is 1,81m, the woman 1,65m. That is at least one ‘head’ difference, which is quite much. It is not really surprising or shocking. The poorer the country, the worse the nutrition and the medical care, the smaller the people. Germany has in average a very healthy population, which makes its people ‘grow higher’. I – ‘I don’t like it, I LOVE IT!’ I will never forget the tour guides using this phrase for every third picture they took of the tourists. If they were not that good at guiding, they could certainly work as photographers. They knew exactly how to take good pictures. The phrase brought every seriously posing tourist to laugh and loosen up for the picture. I had such a good time only watching them doing their second job. More than 7,000 Islands. Do I need to say more? Backpacking in the Philippines is fun. If you have to book flights during your trip, you might find yourself every now and then with an internet problem. Most of the guesthouses and hostels claim to have WIFI, but very often, it is just not working. Nobody knows why. Sometimes it is working without any problems, some other times (of course when you need it the most) it is not working at all. If you really need internet, it is advisable to get some cheap mobile internet. This way you can at least keep in touch with your loved-ones and check out the most urgent information you need for planning your further trip. J – The one and only national symbol of the Philippines, the jeepney. I cannot imagine the Filipino roads without it anymore. The head, rather the front looks like a Mercedes from the 1920s, the back like the short and super tight version of a bus. Inside of it are two long benches where in average 20 Filipino squeeze in. They are always packed. If there really is not any more space for more Filipino inside of the jeepney, they will just go on its roof and sit there. Dangerous, but possible. I was once riding on the rooftop within the mountains. In every single curve, I was scared the laws of physics would throw me overboard. It was pure adrenaline! 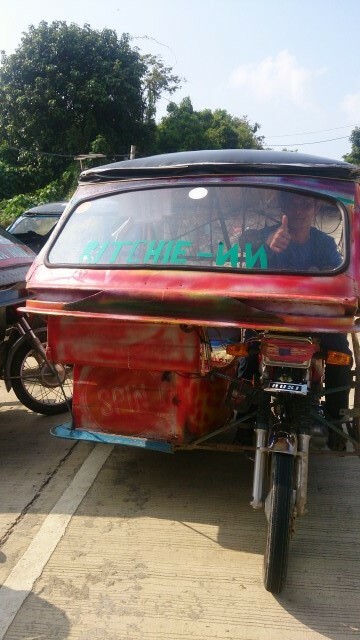 The jeepney is definitely the coolest vehicle I have ever seen in my life! It cannot have any more style! Every jeepney is different and unique in its own special way. Driving in it or on top of it, at the end, it is always fun and certainly an adventure! 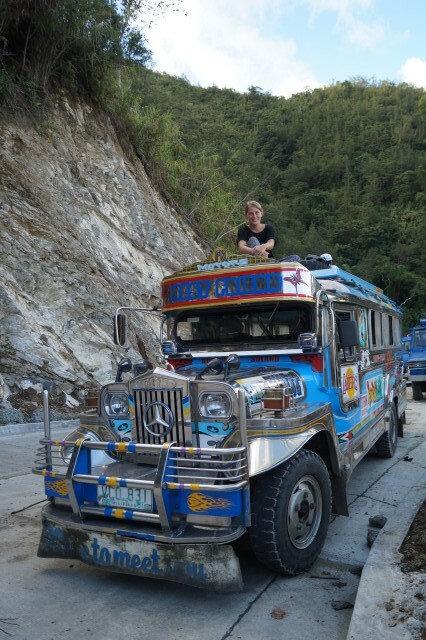 Even though the jeepney is kind of the public bus of the Philippines, there is, of course, no schedule. You have to know about its route and its schedule. A taxi driver once told me they did this on purpose because they just do not want foreigners, well tourists and travelers, to use it. The jeepney was the local means of transportation that everybody can afford. One ride is 8 pesos. Literally nothing. The foreigners on the other side have the money to take more expensive vehicles like a taxi. K – Filipinos love, love, love KARAOKE! Even if they are poor and do not have much, they will always have a karaoke machine somewhere. You can see it everywhere. Most of the times they set it up in the middle of the sidewalk and just sing, sing, sing all day, all night long. I have to admit the Filipinos are very good at it. They do know how to sing and create a good atmosphere. The Filipino Knigge advises: Never refuse to sing if they want you to and never ever make fun of someone who is not quite a singer! Certainly, no fun to watch are the kids not only selling cigarettes on the streets, but also smoking. It really hurts to see child labor. Especially, when you consider how cheap public schools are in the Philippines. The parents only have to pay 2 € for their kid to attempt school. But of course, why sending a kid to school if it can work at the same time and bring money back home? You cannot really do anything against it, but at least, you should not support it. Never ever buy anything from a selling kid. They will not buy themselves anything with the money, no, they will bring the money back home and give it to their parents. 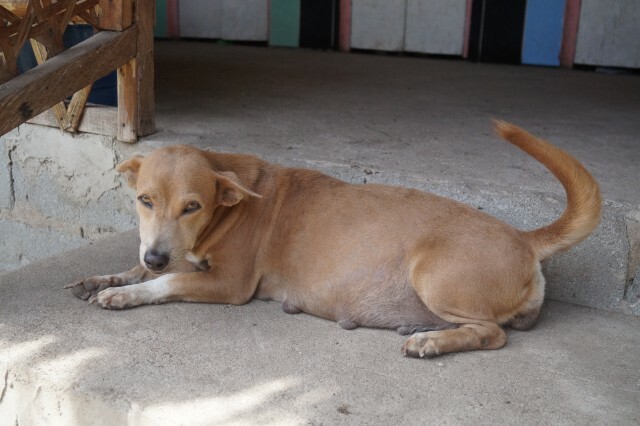 You can help them more if you just take them to a restaurant for example and buy them something to eat and drink. 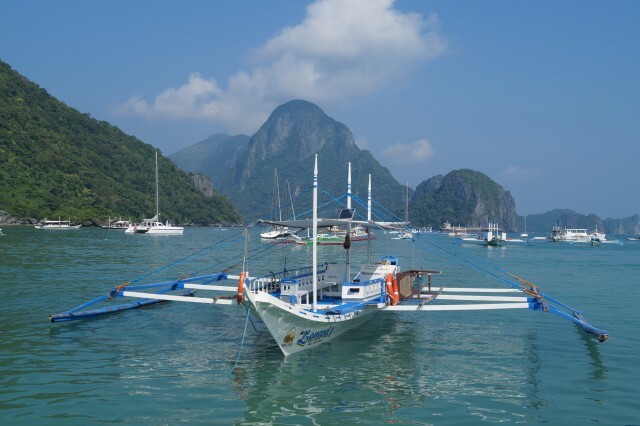 L – Traveling in the Philippines is very easy-going and convenient, especially since almost everybody knows English. You can make yourself understandable and get all the information you need without any problems in communication. The multilingualism in the Philippines is impressive! They have two official languages: English and Filipino (Tagalog). In total, there are approximately 175 languages (!!!) spoken in the Philippines. Considering 7,000 islands the variety of languages is not really surprising. In school, every Filipino is learning Tagalog, the ‘main’ language spoken in Metro Manila. As soon as you go to other parts in the Philippines, people will speak a different language and consider ‘Tagalog’ as the ‘fancy Metropolitan’ language. When people from Metro Manila are going to such areas, they will not understand the language spoken there. They have to communicate in ‘Tenglish’, a mix between Tagalog and English. If you are staying for a longer time in the Philippines, you should definitely think about buying a bucket. It is the most useful tool you could actually have! You not only need it for taking a shower or flushing the toilet, but also for doing your laundry. Buy your tiny little plastic packet of detergent, put it together with your dirty laundry in the bucket, fill it up with water (cold is fine), wait for 30 minutes, rinse it, hang it up, done. M – The first ‘cultural difference’ I noticed when I arrived in the Philippines, were people calling me ‘Ma’m’ or ‘Madame’ all the time. First, I was confused and did not quite understand. Do I really look that old to them? Up to now, everybody told me how young I was looking. Hm, maybe not for them. After a while, I realized it is just a form of showing their respect for each other. They were calling every woman ‘Madame’ and every man ‘Sir’ no matter where they were from, also the locals. A very, very polite way of communication. At the end, I actually really liked it. Let’s talk about money, money, money. The Philippines is a developing, ergo poor country. Everybody looks for a way of making money. Which is the best one? The easy one, of course. What is the easiest and most convenient way of making quick money? Ripping off tourists, of course. No matter if you are from Europe, Australia or the States, people will immediately recognize you as a foreigner. They will immediately sniff a chance. The classic of all the different ways of ripping foreigners off: Taxi. The driver will turn off the taximeter and just tell you how much it is to get from A to B. In average, they will name you a price five times as much as the actual price. You should always wait until you find an honest taxi driver who is actually using the taximeter. But even then you should be careful, because sometimes the taximeters are not working properly either. Different scenario: If you are going to a shop or to the local market, usually you will not find any price marks. You have to ask how much the product is. As soon as they hesitate and think about it for a moment, you can be sure they just make up a price. So go and check all the others until you find another honest seller, again. FYI: The Filipino will always ask you where you are from. Take your time and think about your answer. As soon as you ‘admit’ you are German, they will assume you have money. Then you can totally forget about bargaining! It is a better idea to come from poorer countries like Poland or countries they usually do not know like Scandinavia. Your chances for bargaining or getting the ‘actual price’ will be much higher! If you want to spend a lot of money, just go to one of the billion mega malls they have in the Philippines. Their size reminded me more of a small city within the city. You will find everything there. People love spending a whole day inside of the mall, which you can do easily without even seeing every shop they have in there. O – I do not know how many times I felt overwhelmed in the Philippines. Sometimes because everything was too much. Too many people wanted too many things from me; too much was going on. Some other times because it was just too beautiful, too breathtaking. The nature, the exploring of the underwater world, the adventures, the activities. Incredible. Indescribable. Unforgettable. The usual way of transportation on the sea is with the Filipino pumpboat, a certain type of boat that only exists in the Philippines. It reminded me of a catamaran although they do not have anything in common at all. The typical feature of the pumpboat are the two outriggers that apparently help for keeping the balance just in case they actually have some wavy weather. It is hard, rather impossible to tip over. R – Having a good rest in the Philippines is almost impossible if you are traveling on low budget and staying in cheap guesthouses. Why? Because you will be surrounded by rooster. It seems like every Filipino household has its own rooster. Why? Because they still have illegal cockfights going on. Something is definitely wrong with the Filipino rooster. When I was a kid, I learned about rooster that they would only crow when the sun is rising. Not in the Philippines. There, they would crow every 90 minutes all night long. During the day not, of course. They just want to keep you from sleeping. For whatever reason. Maybe as revenge for still being misused for stupid cockfights. The worst time I had, was in Coron. I do not know how many roosters surrounded me, but I could not find proper sleep for a whole week. Totally exhausted, I was happy to go on a 14 hour ferry trip where I could (hopefully) finally sleep. I mean the ferry would be a rooster-free zone, right? That is what I thought. Well, it was not. They even brought their roosters on the ferry! I was speechless, and, again, sleepless. S – If kids are going to school, they go there really early in the morning. Usually, school starts at 6am because otherwise it would be too hot to study anything. I already mentioned the two questions Filipino will always ask you. Traveling alone as a woman… there will always be a third one that they usually ask first: Are you single??? If I had a Nickel for every time a Filipino asked me this question, I would be f*****g rich now! Are you married? Where is your husband? Where is your boyfriend? You are traveling alone? It was super annoying. Even though I was wearing my fake wedding ring, they just would not let go from me. The Filipino man can be very persistent. At the end of my time in the Philippines, I was a married woman whose husband could not join me because he had to work (last minute, of course) and earn the money for my travels. Sometimes I even had a kid back home. Shocking to them, but at least they left me alone after that story (most of the times). FYI: I felt safe traveling alone as a woman in the Philippines, but next time I would definitely go there with a friend just to avoid all those awkward moments with men. The Philippines is a country of thousands of islands. It is surrounded by nothing but water. Nevertheless, knowing how to swim cannot be taken for granted. I was shocked about how many Filipino cannot swim. On our Island Hopping tours, all the Filipino tourists had to wear a life vest and the guide had to float them from A to B. They were terrified by the water. I could not believe it. I still cannot. Besides of traveling, writing and taking pictures I do not have any other hobbies or passions. Until the Philippines. Now I have one more. Scuba diving. I did my PADI Open Water course and fell in love with the aquatic life. Being able to breathe and see underwater opens up a whole new world. I felt like Ariel hanging out with all different kinds of school of fish, swimming with them, exploring the variety of the marine life down there. The Philippines is certainly the perfect place to learn scuba diving. The water is tropical hot, clear and calm, the reefs are colorful. The perfect conditions for a total beginner. T – There is so much to see in the Philippines. It is hard, rather impossible to go everywhere and see everything. I missed the Tarsier monkey, for example. It is THE Filipino emblem! 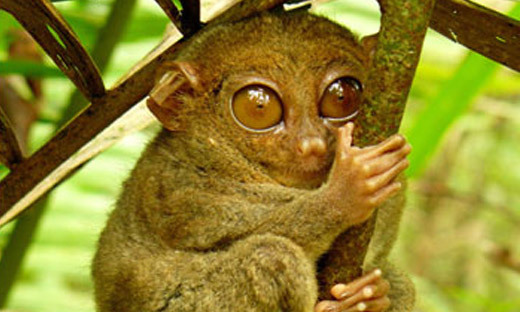 I just did know that you could only find the Tarsier on Bohol Island. I thought he was everywhere… Well, now I know better. Such a cute little creature! Next time I am in the Philippines, I will definitely visit the little monkey pie. On my next trip to the Philippines, I will also adapt the local way of sticking a towel between my neck and shirt. You are sweating all the time, but this way you have at least something to wipe the sweat away or something that soaks in all the sweat. Anyhow, it is really useful. There are several ways of transportation. I already mentioned the jeepney and the pumpboat. U – I fell in love with the underwater world! Its variety, its diversity, its beauty! There are no words to describe the feeling of flying underwater, hanging out with fish and exploring the colorful coral reefs of the Philippines. This is something you should definitely check out in your life! V – Even when you are traveling on a low budget, you will find a ventilator in your room. Otherwise, there is no chance to survive the heat in the Philippines. If you are willing to spend a little more money, you will even get an ‘AIRCON’. You cannot imagine how many times I was actually freezing in the night because the air conditioning in the room or in the bus was put on f*****g icy 15°C! During your stay, you will catch a cold at least once due to the crazy air conditioning… Be prepared! W – Why walking if there is a jeepney or a tricycle? Everything is ‘too far’ and it is definitely too hot to walk. So give your legs a break and hop on one of the many Filipino means of transportation. It seems like it is the actual Filipino way of going from one place to another. They usually do not walk. If you ever need to buy cosmetic products in the Philippines, carefully read the description. Most of the crèmes have whitening potion in it. Especially the Filipina woman does not want to have any tan at all. White skin is an ideal of beauty. That is the reason why they even add bleaching substances to facial crèmes, body lotions or sunscreen. Z – An activity they like to offer in several places is zip lining. Sometimes you zip line very high, some other times above the ocean from island to island or in the middle of the forest. No matter where, it is fun for sure!